Model of the Year 2017: who beat out Kaia Gerber and the Hadid’s? It has been a big year for Kaia Gerber, who was no stranger to the fashion industry thanks to her supermodel mum, Cindy Crawford, but was somewhat thrust into the deep end at this year's fashion circuit. Just about every designer from Karl Lagerfeld to Alexander Wang wanted the sixteen year-old model on their runway. Likewise the Hadid's, who both earned a spot on the Forbes highest paid models 2017 list, among earning their wings in the Victoria's Secret Fashion Show (although undisclosed circumstances meant Gigi could not walk). 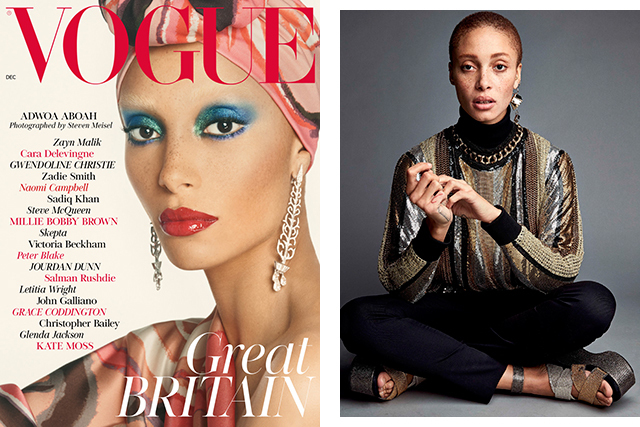 But the model who had the biggest year is Edward Enninful's British Vogue cover-girl, Adwoa Aboah. Aboah was awarded Model of the Year at the 2017 Fashion Awards on Monday, beating out the Hadid's, Gerber and Winnie Harlow in earning the prestigious title. The honour is awarded by the esteemed British Fashion Council and celebrates "the global impact of a model, male or female, who over the last 12 months has dominated the industry." Being the only Brit on the list certainly didn't hurt the case for Aboah, who joins the likes of Kate Moss, Cara Delevingne, Agyness Deyn, Jourdan Dunn, and Edie Campbell (all Brits) who have won the award in the past. In 2016, Gigi Hadid was awarded the honour, making her the first American model to receive the title. Other notable wins at the 2017 Fashion Awards include Donatella Versace who received the Style Icon award, Raf Simons who was awarded Designer of the Year, and Off-White who won Urban Luxe Brand. The comprehensive list of winners can be found here.